Hi friends! My good friend @rhys.tattersall moved back to Sydney not long ago so we caught up in the city for a hang & photo session. 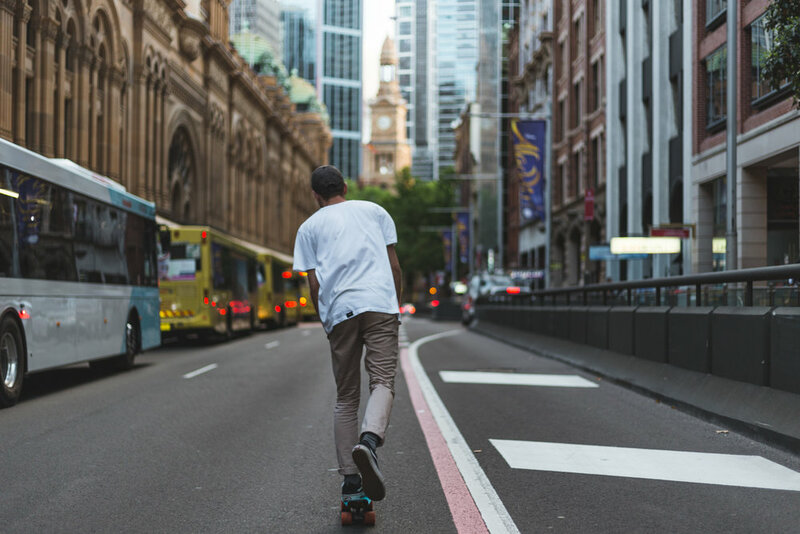 It just so happened that the kind folks at Penny Skateboards had sent me one of their nickel boards to play around with so we took it for a spin around the Sydney CBD. The 22" penny was perfect for the occasion; casual hangouts in the city. We started off at this rad overpass. I had seen this spot in a few of @borneon.lad's photos before and liked how the lines worked in photos. The light was just right (5:30PM); dark enough to give it that moody urban feel, but just enough to light Rhys & the Penny board up. The next spot we hit was just around the corner, in between UTS and Haymarket. This spot is pretty cool. It was quiet enough for us to skate around without bothering anyone and had a rad red wall as a backdrop for our photos. We tried a few types of shots. The pan shots (above) with the motion blur in the background was done by using tracking auto focus and a slow shutter speed. You pan your camera along with your subject and burst a bunch of photos to capture the subject in focus whilst giving the background a nice natural motion blur. Our last spot of the day was QVB. 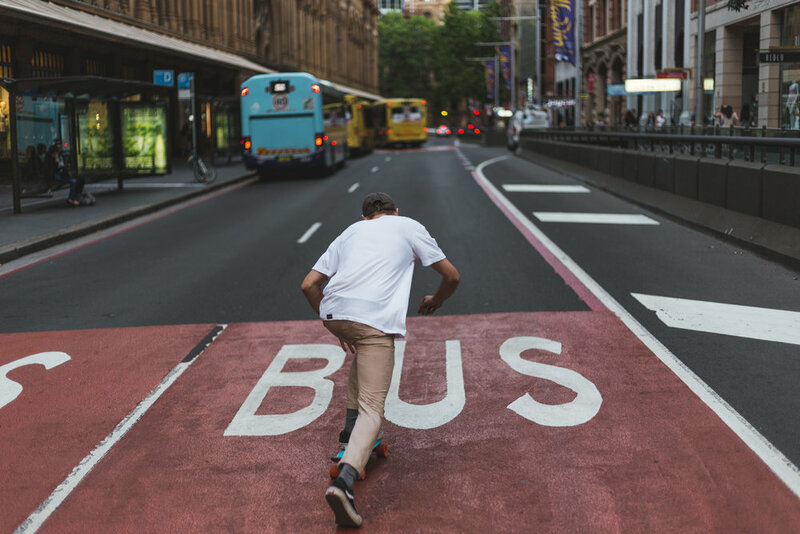 We stopped here for a coffee and saw the opportunity to take some street style skate shots with the CBD as the backdrop. All in all, we had a pretty chill day. The penny board was the perfect prop. It gave us something specific to shoot, rather than just aimlessly wandering around town looking for something to happen. 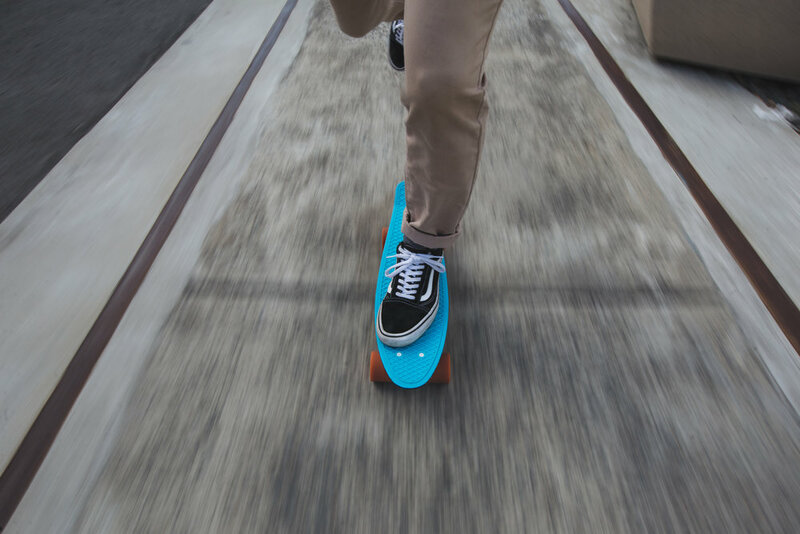 If you're after a similar skateboard I definitely recommend Penny Skateboards. They are the brand for this type of board. The board they sent me (seen in this photo set) is the Neo Tokyo 22" which you can check out here. Huge thanks to @rhys.tattersall for skate modelling and Penny Skateboards for sending me this rad penny board. *This post was sponsored by Penny Skateboards.